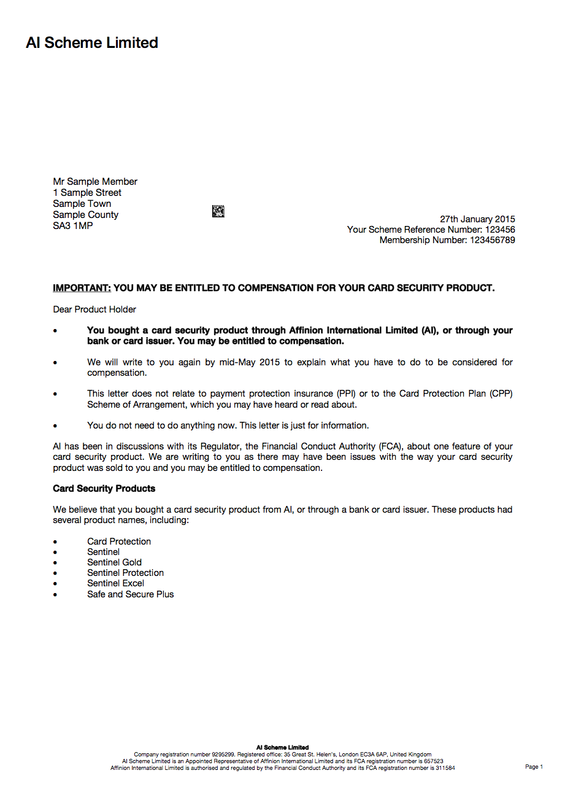 If you're one of the two million flogged worthless card protection by Affinion (often branded Sentinel), you should have received a letter informing you about a redress scheme. If you haven't had one and think you're affected, call the scheme now. You may be entitled to £100s back if you got Affinion/Sentinel card protection either directly, via a bank such as Barclays, HSBC, Lloyds, RBS and Santander, or from a card provider. See our Sentinel (AI Scheme) card protection guide for full step-by-step help to reclaim your money. Letters were sent out between 27 January and 23 February 2015 to those affected telling them that a redress scheme called 'AI Scheme' had been set up by regulator, the Financial Conduct Authority. Sentinel told customers to allow a week for letters to arrive by, but as this deadline has long passed, if you've not received one and think you should have, call the Al Scheme on 0800 678 1930. It may be that it's got the wrong address for you. I've got the letter. Do I need to do anything? You don't need to do anything when you get this first letter. It just explains that you may be entitled to redress. You'll then be sent another letter by mid-May 2015 to vote for the scheme, then another to claim for compensation, if the scheme gets the go-ahead. It's crucial to be aware that these aren't spam, or in any way related to PPI or other types of reclaiming. Some readers have already told us they may have wrongly binned their letter. As Paul tweeted: "Knew not to bin AI letter thanks to @MoneySavingExp. Could be in line for £160 compensation + interest #fingerscrossed."